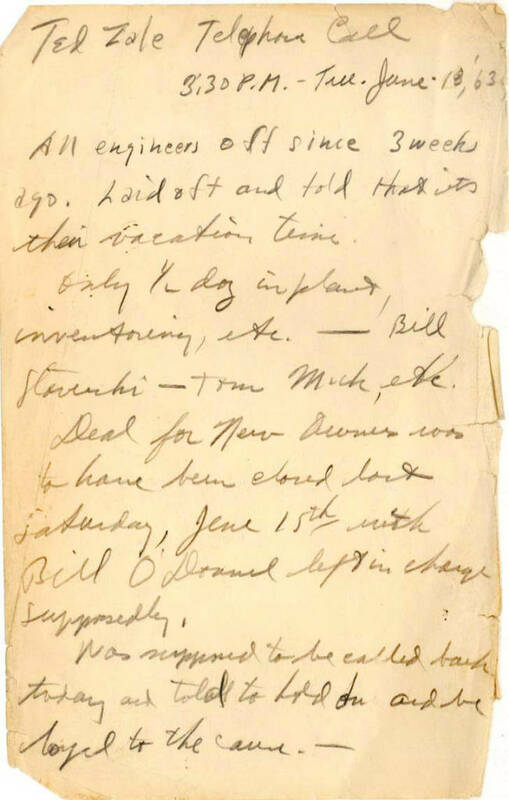 For most residents of Chicago, May 14, 1901 was a nothing more than a beautiful, warm Spring day. For Boleslaw Zalewski and his young wife Anna (Wasielewski), it was a day of celebration as they welcomed their first child into the world—a son they named Thaddeus. Boleslaw, a professional musician, was born near the border between Poland and Russia in 1876, and immigrated to the United States as a teen. His wife Anna was a first generation American, born in Nebraska, who married her husband soon after her 16th birthday. Boleslaw and Anna would go on to have three more children—Casimer, Sophia and Harriette—but it was Thaddeus who was destined for fame and fortune. Young Thaddeus, known as ‘Thad’ to his family and friends, had an apparently uneventful childhood, growing up in a large apartment building that would today probably be described as a tenement. He was whip-smart though, and managed to make his way into college, at least for a year, in an era when most children from working class families simply did not have that option available to them. In his early 20s, he married Muriel Kirsch, and in 1925 they had their only child (Robert). Sometime between 1920 and 1930, he decided to change his last name from the decidedly ethnic Zalewski to the andro-ethnic ‘Zale’, and at some point ‘Thad’ became ‘Ted’, though he continued to use Thad for legal purposes for the rest of his life. Ted and his young family were wanderers in the early 1930s—likely attributable to efforts to find work, and lived in no less than five cities between 1930 and 1934, doing whatever work he could find, including stints as an attendant, printer, restaurateur and in sales. By 1934, the marriage between Thad and Muriel had failed. He returned to Chicago, while she moved to Chickasha, Oklahoma with young Robert. Buying a home on Kingston Avenue, Ted settled into a career as a commercial printer, and by 1940 was the manager of the plant. Now approaching 40, Ted was soon to make a move that would be life changing, and though he never sought out the camera or the limelight, he was about to become famous anyway. While Zale is of course best known for his illustrious tenure at Bally Manufacturing Corporation, much of his early career and details of his life remain a mystery. It appears Zale’s start in amusement devices was actually with Genco Manufacturing Company. It is not yet known exactly when Zale actually started with Genco, other than it was sometime after 1940 (perhaps that information has been forever lost, though we may be able to narrow that date some when the 1950 U.S. Census records are released in 2022). While he may have had a hand in pinball game development, it is clear that he spent most of his time at Genco working on ‘gun game’ designs, and scored his first patent (2,899,205) on a gun game. His Genco tenure lasted until the company closed in July 1958 (ironically, the patent wasn’t issued until 1959, after Genco had closed). Zale joined Bally in mid-1962. What Zale did for employment between July of 1958 and 1962 is not entirely clear. One working hypothesis is that Zale joined the newly formed Midway Manufacturing Company upon their startup in 1958, and with the closure of Genco (and the two factories existing only blocks apart from one another) this would be an obvious transition option. Midway’s gun games are quite similar in operation to the games Zale worked on with Genco, which would make sense if he were doing them. 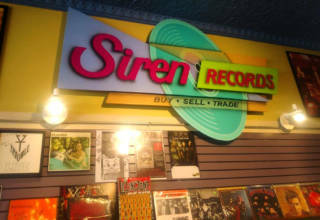 However, the Midway records are scant and those that are publicly available during the early years are silent on much of the company’s design efforts. Perhaps there is an archive of extant Midway documents out there, but if it exists, the authors have been unable to locate them. Regardless, by late 1962, citing frustration with a company that was “hopelessly conservative in outlook”, the 61-year-old Zale moved on and secured a job as the Director of Design at Bally, as Bally returned to the pinball market in earnest after having built mostly slot machines, bingo machines, novelty games (such as 1960’s “Skill Score”) and only dabbling with a handful of flippered pinballs in the prior 20 years. Zale’s time at Bally—and Bally’s return to the pinball market— were both nearly short-lived. 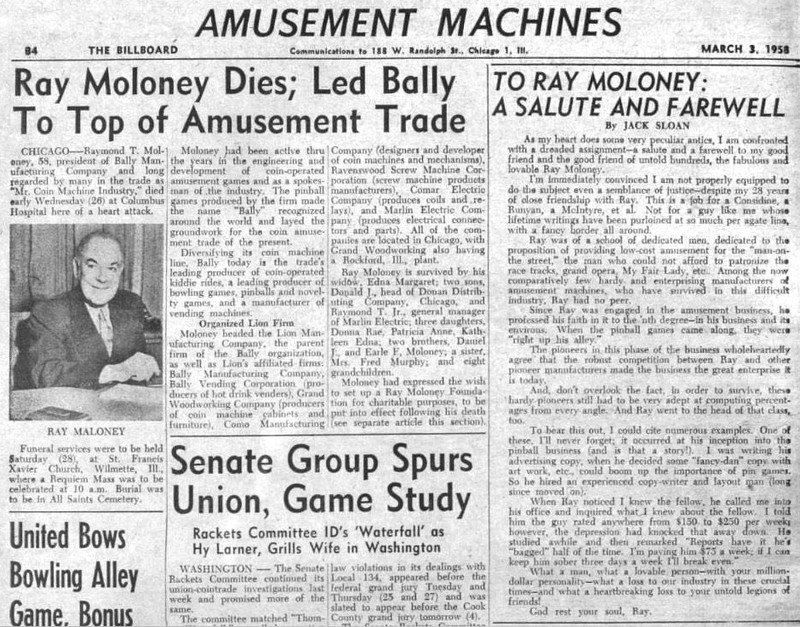 Back in 1958 the founder of Bally Manufacturing Corporation, Ray Moloney, passed away. The company continued to limp along for a few years, haemorrhaging money and selling off a number of assets, but by early 1963 things were pretty dire and the company was put up for sale. 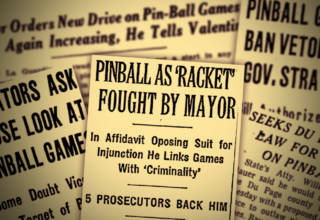 Recently, a note from the Steve Kordek archives has surfaced and it indicates that on June 18th of that year, Zale placed a phone call to Kordek at rival pinball manufacturer Williams. Presumably, Zale and Kordek knew each other from their time at Genco. Zale told Kordek that all of the engineers had been laid off three weeks before, and that the new owners were supposed to have closed the deal to buy the company the previous Saturday. That closing did not happen and Zale was likely concerned about being let go, and though the note does not say it explicitly, he may have been fishing for a job at Williams. That closing did finally happen a couple of weeks later, and a group of investors that included long time Bally Sales Manager Bill O’Donnell took over the company. O’Donnell was named President and he quickly increased the emphasis on building slot machines and other casino games, moving away from the bowlers, bingos and novelty games. 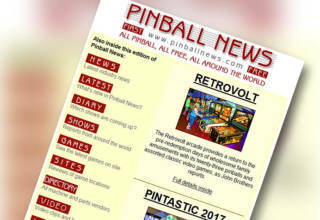 The pinball division was more or less left to its own devices, and with Zale at the helm began to crank out new titles at an astronomical rate. 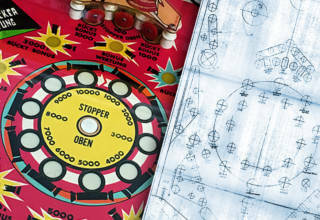 Zale was prolific in regards to his pinball designs, quickly carrying Bally’s efforts to become a serious player in the pinball realm (rather than their historic focus on novelty and bingo games) and leading them to the forefront of the industry. At the peak of his creative productivity, he was turning out a new game once every six weeks on average—and he did not simply recycle old layout and mechanisms with new artwork. 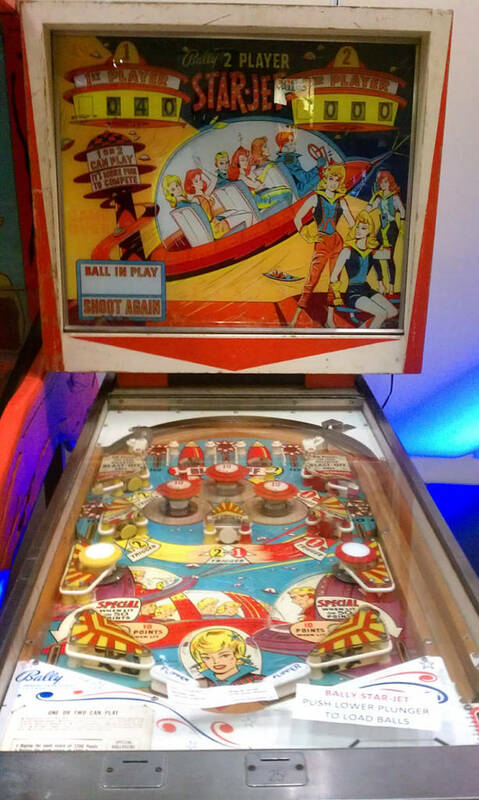 Pinball and its associated art go hand-in-hand, and given the prolific design approach Zale took he had a lot of different artists (at least seven) involved with his pin projects. 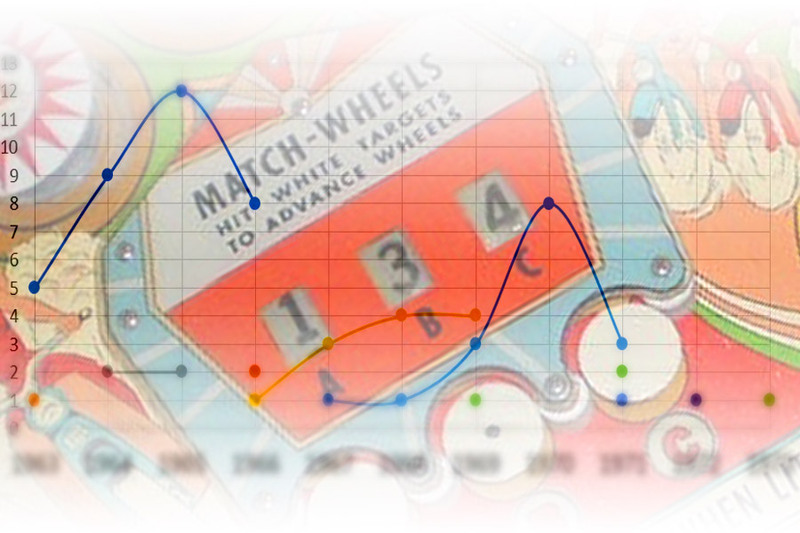 Below is a chart providing a series of pinball artists and the number of Zale projects with which they were involved. 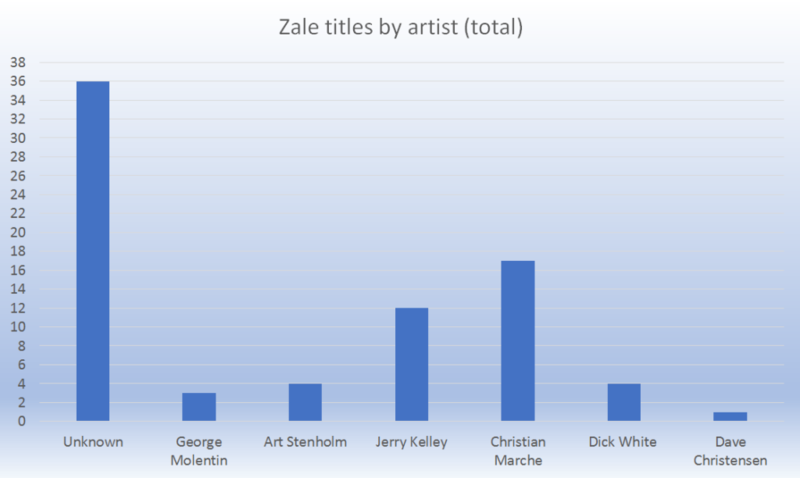 As the chart indicates, a significant plurality of Zale pins did not credit any specific artist with the design work. It remains one of the more significant mysteries of Zale’s time with Bally. Here is another chart, looking at the information a different way: chronologically. As it reveals, most of the unknown artist games were in the earlier years of Zale’s tenure at Bally (notably 1963 through 1966). Advertising Poster Company (also known as Ad Posters, which did a lot of pinball art) is credited in the case of the unknown artist(s), but not the specific individual(s) involved. Zale, incidentally, did have a background in commercial printing before he entered the coin-op industry, so perhaps he had a prior professional relationship with Ad Posters in his past? In yet another mini-mystery, it is not entirely clear when exactly Zale retired from Bally. Protégé Jim Patla estimates it was around 1970, based on Patla’s own start with Bally around 1965 and his recollection that he studied under Zale for five years. This estimate seems reasonable, as a 1973 article in Tropic Magazine mentions that Zale had retired from Bally several years earlier. However, retirement did not mean for Zale what it means for most. 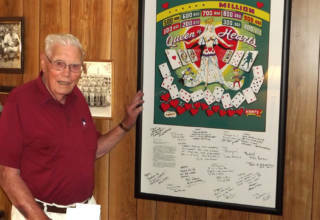 He and his third wife, Inda, relocated to Arkansas, but he kept designing games and sending them in to Bally (not dissimilar to how Harry Williams continued to provide designs to Williams Manufacturing after his own departure from that company). Joust (Bally, 1969), Vampire (Bally, 1971) and Double-Up (Bally, 1970) are three examples of Zale games that Patla indicated were sent in post-retirement. Joust’s release date suggests it was slightly before 1970 that Zale formally left Bally, but no records have been found to confirm his actual departure. As prolific as he was, it is quite surprising how scant the historical record is and how many mysteries regarding his career persist to this day. For example, we are still left with the question of whether any games were released featuring his design work but not credited to him, as Bally did with other designers. A good case-in-point example involves Harry Williams, as records indicate he submitted games he titled Samoa and Bali-Hi to Bally, which were produced with little variation as Sea Ray (Bally, 1971) and Bali-Hi (Bally, 1973), respectively (both ultimately credited to Zale, incidentally). Examples that could have been based around Zale designs are 4 Queens (Bally, 1970), a game credited to Patla (though Patla noted in an interview that he was given Zale’s game and made modifications to it, as part of his training as a designer) and Ro Go (Bally, 1974), a game credited to Greg Kmiec (Kmiec stated in an interview that Zale sent in the Ro Go design to Bally). Could there be others? Aside from uncredited game designs and the aforementioned mystery artist(s) who worked on Zale games, there are a number of other interesting unknowns involving Zale. Most notably, that no publicly available photo of Zale exists at this time, but there are also a number of other interesting questions centering around his coin-op work. – When did Zale start with Genco? He made gun games with them and it is believed he stayed until Genco closed, but it isn’t clear how long that tenure was. – What did Zale do after leaving Genco and before joining Bally? As noted earlier, one theory is that he joined Midway (which would have been starting up around the time Genco closed its doors) and helped them with gun games, but no documentation has been found to confirm this. – What did Zale do for work before joining Genco? Did he work for Ad Posters? Perhaps for Ad Posters rival Reproductions Company who were also doing work for many of the pinball companies in this same time period? Perhaps the answers to many of these questions are out there, in some archives that have heretofore remained inaccessible publicly. 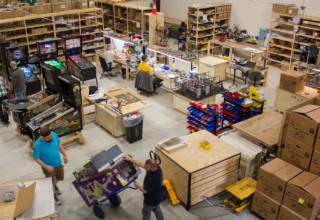 Regardless, what we do know of Zale is he was a pioneering innovator when it came to pinball design – prolific in output and willing to take risks – and led a company from being basically uninvolved in pinball into its status as one of the three largest manufacturers of pinball games in the world. 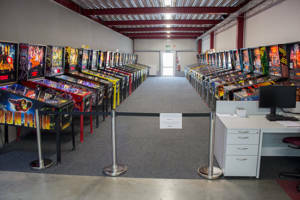 His legacy in pinball is felt today, and though many in the hobby may not know the name Zale, it warrants the same consideration and respect commanded by names like Kordek, Lawlor, Ritchie and Williams. 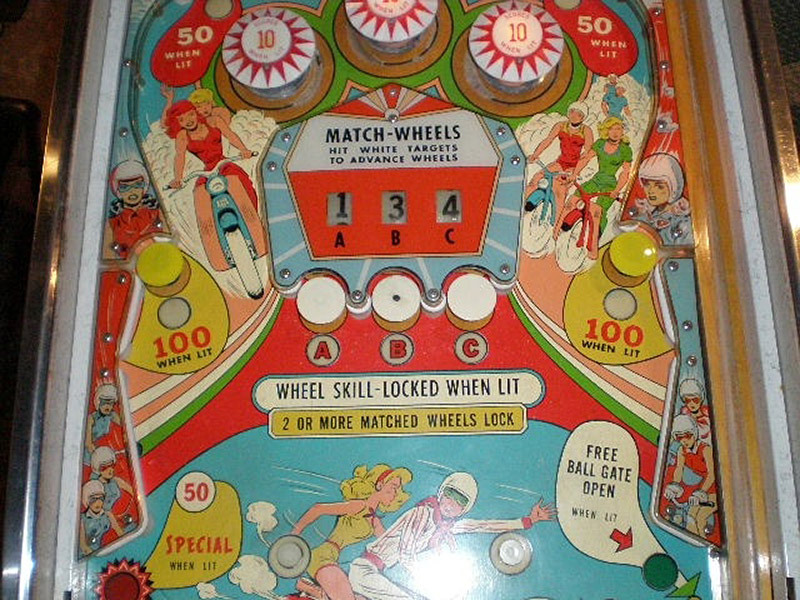 I would suggest that perhaps Zale cannot be credited with the inclusion of 50V circuitry and standardized 110V transformers in their flipper games – for many years prior to Zale’s start at the company, Bally had been using this improved process and transformer setup in their bingo pinballs. I suspect that the push to use the bingo transformers in flipper games came from the engineering or accounting department and was not a requirement from Zale. Bally was unique in that they made a lot of their own parts – items like fuse holders, lamp sockets, and Jones Plugs. In these instances, their use in the flipper games were probably not the mandate of a designer. I am always interested to learn of how the curtain between the gaming division and the amusement division was parted, though. Hi Nicholas– Glad you enjoyed the article. I agree with you in part. It’s not as though Zale *invented* the notion of using the 50v circuit in games. As we mentioned in the article, 50v was used to power solenoids on some Williams games (and probably other manufacturers as well). As you rightly pointed out in our Facebook conversation, Bally used 50v in many bingo games before Zale even arrived with the company. 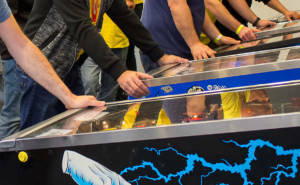 You’re probably right that the push to incorporate them into the pinball games came from accounting or engineering– nonetheless, the fact remains that Zale was the one who standardized on the 50v solenoid for pinball. I base this claim primarily on an article entitled “Bally Introduces Motor to Standardize Games” from the December 7th 1963 Billboard (I apologize– I don’t know how to hotlink these pages, but you can get to it via Google Books). Also, Bally references the 50v usage as a selling point in the flyers for Moon Shot (2/1963), Hootenanny (11/1963), and specifically defines it as a new standard feature in the flyer for Star Jet (12/1963). It was also used on Cue Tease (7/1963), but not advertised as a selling feature. We have flyers for 3-in-Line and Cross Country which also came in between Moon Shot and Star Jet… the flyers don’t advertise 50v, and I was unable to track down a schematic for either, but it’s entirely plausible that they had 50v as well. 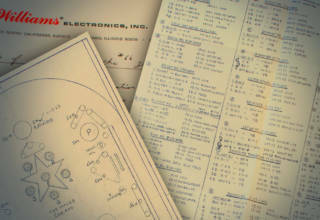 Either way, it’s clear that Bally standardized first, and that Zale was designing machines with a 50v solenoid circuit from his arrival with the company. My guess is Ted probably stayed on with Genco after the sale. The Gensburg Bros sold out to their other brother Sam, and Sam Wolberg at Chicago Coin. Reports at the time suggested that Genco games would still be made under the Chicago Coin brand but there was no mention of the imminent closure of the Genco plant. When it did close is uncertain, but perhaps Ted stayed on with Chicago Coin for a time?